“Systemically these were very valuable interventions by the EU – it put us on the best footing to take inclusive education to scale,” said Schoeman. Literacy and numeracy rates are a cause for concern in many South African schools; in 2016 the government asked schools to condone a 20% maths pass mark for pupils in Grades 7-9. One of the fundamental issues over the years has been a lack of basic classroom resources such as workbooks – something the Department of Basic Education has helped to turn around since 2012 with EU support. A workbook project, funded by the Department of Basic Education through the EU’s Primary Education Sector Policy Support Programme, aims to supply numeracy and literacy workbooks to every child from day one in Grade R to the end of compulsory education in Grade 9. 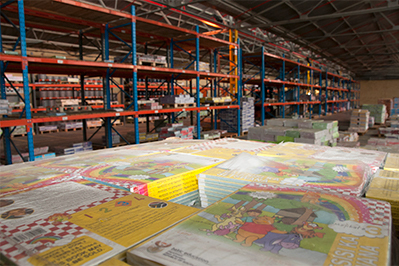 Carried out by a joint venture of three firms – printing companies Lebone Litho and Paarl Media, and delivery firm UTI – it prints and delivers some 56 million workbooks each year to over 24,000 schools, the majority in rural areas. In the process, they created 3,600 permanent jobs across the production chain, from printing and packing to warehousing and distribution, and employ over 5,000 people at peak times. “It’s an amazing success,” said Hubert Mathanzima Mweli, Director-General for Basic Education. “We started this project in 2012, and the improvement in numeracy and literacy from then till now is more than 20%. 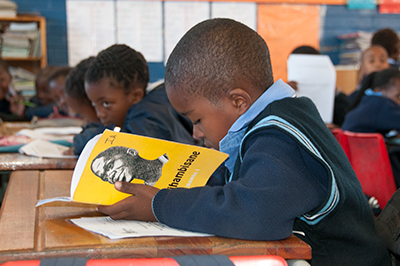 Learners in Grade 6 are now performing at Grade 6 level; unlike before, they used to perform at Grade 4 level.” Printed on sustainable paper with toxin-free ink, the books are available in all eleven of South Africa’s official languages, plus braille and large print. All for the price of less than a croissant per book, according to Keith Michael, Chief Executive of Lebone Litho Printers. In the following video, Keith Michael and Mike Ehret outline the project. Skip to 0:05 for Hubert Mathanzima Mweli on the project’s impact; 1:00 for Keith and Mike on the logistical challenges and solutions; 2:16 for the IT system which keeps track of every book throughout the process; and 3:01 for the next steps in terms of scaling up. With additional funding, Mweli would like to see the number of subjects increased beyond literacy, numeracy, English as an additional language and life skills, to cover all academic subjects as well as vocational education and training. One school which has benefited from these books is Isiziba Primary School in Gauteng’s Ekhuruleni North District. It is one of around 900 full-service schools in South Africa – a relatively new breed of school adapted to welcome children with different educational needs. At Isiziba Primary School, 108 of the 1,309 pupils have learning difficulties. All 35 teachers have been trained on the Guidelines for Full Service/Inclusive Schools and the Policy on Screening, Identification, Assessment and Support and received training on supporting learners who experience barriers to learning and development. A School-Based Support Team (SBST) provides ongoing guidance to the teachers, and a learner support educator comes daily to provide remedial support to learners. The school hopes to receive funding for more educational support staff, occupational therapists and social workers, which would make a big difference to the pupils’ development. Children travel as far as 30 km to attend the school, which is one of only two full-service schools in the Tembisa area. “Some come by bus, some by taxi [minibus], and some walk,” said Nkosi. The pupils gave Capacity4dev a tour of the school. Skip to 0:52 for Principal Nkosi on the school’s learners and languages; 1:19 for the food scheme and library; 1:50 for the Principal on the ongoing challenges, including overcrowding and lack of resources; 3:29 for Marie Schoeman from the Department of Basic Education on progress towards full service schools. Although teachers are being trained to adapt the academic curriculum for learners who experience barriers to learning, there is still a need for a more structured vocational curriculum. Many learners with an interest and aptitude for vocational education and training currently leave Grade 9 without a nationally-recognised exit-level qualification. “The Department of Basic Education pushes schools to write the Annual National Assessment. But if you don’t follow the full curriculum, that means you’ll send your children into an exam they can’t pass,” said Dimitri Theron, Headmaster at Kempton Park Panorama School, one of 67 vocational schools in South Africa. “That is a serious challenge for us. Our learners do part academic, part vocational. We follow the mainstream adapted curriculum, and we also follow the departmental guidelines for vocational education and training. But it’s not standardized; so you cannot compare with other schools with learners like ours, as they will have adapted the curriculum differently,” said Theron. 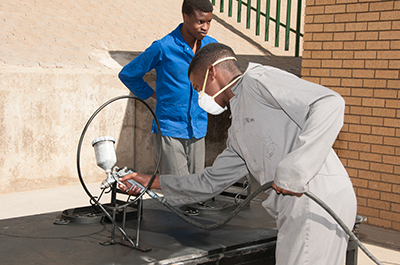 Kempton Park Panorama School is considered a good example of a school providing vocational education while catering to learners with different needs. Based in Ekhuruleni North district, it takes in learners with moderate and severe intellectual disabilities, as well as learners with epilepsy and cerebral palsy. The school also offers remedial education and reading support to learners who would otherwise drop out of education – which means they have a second influx of learners from high schools in the second term of the year. An important part of the course is on the job training. The school cultivates links with bakeries, nursery schools and mechanical workshops which take learners for workplace skills development. In the following video, Capacity4dev visits workshops for motor mechanics, welding, hairdressing and cooking. Skip to 0:05 for Marie Schoeman on South Africa’s vocational education pathway; 0:33 for Dimitri Theron on the school and its learners; 1:49 for a motor mechanics workshop; 2:40 for welding; 3:30 for hairdressing; 4:12 for teacher training for primary education; 4:40 for cooking; and 5:20 for Theron on learners’ job prospects. The vocational education programme is not only being introduced for the benefit of learners with disabilities but aims to create differentiated curriculum pathways in senior primary and in secondary schools for learners who have an interest and aptitude in vocational education. It is considered a critical contribution of the Basic Education sector towards addressing the skills shortages of the country. The most important lessons learnt since 2002 are that inclusive policies, systems and resources are critical to ensure radical and wide-scale transformation of the whole system, but that real change and successful implementation happen at community, school and classroom level.